* 4.09% APY for accounts with a maximum of $10,000 that meet qualification requirements. * 0.56% APY for deposits between $10,000 and $25,000 that meet qualification requirements. * 0.35% APY* for balances over $25,000.00 that meet qualification requirements. * 0.01% APY* for members whose qualification requirements are not met. It seems that the better rates are only given to those who satisfy their requirements. So what exactly are these? If it happens that you can’t meet all four requirements stated above, you may still avail of free online banking and free online bills payment. Even if you can’t comply with all the requirements, there are a lot of good things that Free Checking can offer you. First, there is no minimum balance required and no ATM fees. You also get to have a free Visa Debit Card, free mobile banking, free online banking and bills payment, and free eStatements. Plus you also get unlimited check writing. Overdraft privileges are also offered protecting you from overdraft charges. Anyone can apply for this free checking account. Even those who already have accounts with Consumers Credit Union. Non members may also join by paying a one-time fee of only $5. 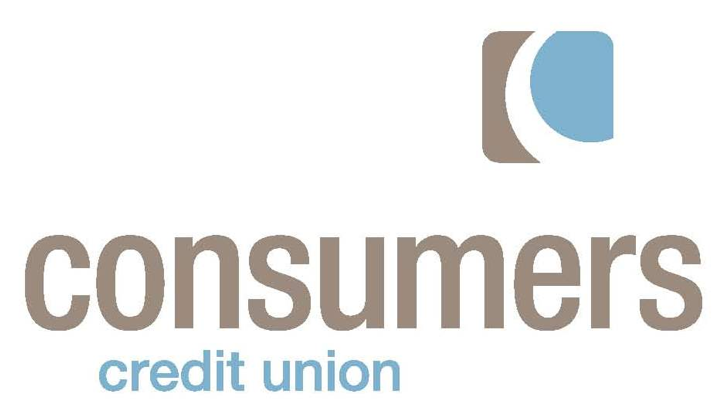 The credit union is located in Lake County, Illinois and has no membership requirements. It was established back in 1930 and is also insured by the NCUA. For those who are still looking for a great free checking account, then now may be the time to get one especially with the incredibly high interest rate they offer. The sooner you apply, the more time your money can grow. 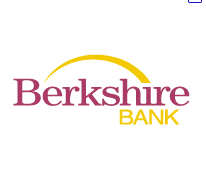 Berkshire Bank has currently made some changes on their rewards checking account. This new version is what they call the Super Power NOW Checking and some of its perks include a good 1.20% interest rate. Most checking accounts don’t have an interest rate, so for those who make it a practice to keep money in their checking account, having an interest would really help boost your earnings. Aside from the rate, an interesting thing to note is that Berkshire Bank has decided to eliminate the need of debit card usage. Before, the checking account used to require 6 debit card purchases that amount to the total of $100 per statement cycle. Today, this requirement is eliminated and all consumers have to do is make a direct deposit of at least $500 either from a salary or pension. If these terms are not met, then the interest rate may be waived. A downside to the checking account is that if the minimum balance of $1,500 is not maintained, a monthly fee of $10 will be imposed. In order to open an account, a visit to any of their branches must be made. Berkshire Bank Branches can be found in New York City, Brooklyn, Bloomingburg, Harriman, and Goshen. Branches can also be found in some locations in New Jersey such as Ridgefield and Teaneck. The rate on this promotional checking account is announced to last until April 30, 2012 so it’s best to take advantage of the rate at the earliest time possible. This account is ideal for those who don’t like using debit cards. This rate is also competitive to other banking institutions such as Flagstar bank with a 1.25% rate, and UFB Direct with 1.30%. This annual rate from Berkshire is higher than the highest nationally available among CD rates which is 1.15% from CIT Bank. Berkshire bank is an FDIC Insured bank that has roots since 1871. There are still banks out there paying 4% on high yield checking accounts and are open to anyone, anywhere. It’s amazing to see these banks still paying 4% because you won’t find these kinds of returns with any top CDs, savings or money market accounts. 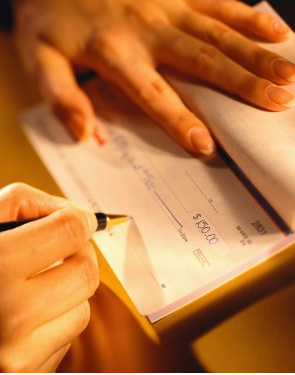 It’s hard to find a better deal than with these reward checking accounts. Most CD rates are paying significantly less than they were a year ago, September 2009 and yet these reward checking accounts have stayed the same or close to 4%. If you are looking for the best rates then reward checking might be the way to go. The only problems you will face are their requirements for receiving the high interest rate. $25,000 from First Clover Leaf Bank. The My Great Rate Checking is easy to obtain by meeting a few of their requirements. First Clover Leaf Bank has three branches in Edwardsville, IL and one in Wood River. $25,000 from Danversbank. The Free Rewards checking account will pay 4.01% on balances up to $25,000. Be sure to read their monthly requirements for obtaining this great rate. $25,000 from Baltimore County Savings Bank. $10,000 from Capital Bank. Their Smart Checking account will pay you 4.01% and has 32 branches in North Carolina. $10,000 from AmericanNet Bank. Find their Reward Checking account to view the requirements for earning 4%. All reward checking accounts require you to follow a few rules to earn their high interest. Usually they want you to actually use their services, instead of just opening an account and stashing your money there. Most reward checking accounts will have you using your debit card at least 10 times a month, opt in for online banking and will require you to have a direct deposit set up on a monthly basis. For any month you do not meet the minimum requirements your earnings will drop to their average interest rate, some are as low as 0.10%. Reward Checking accounts are different than Checking Account Promotions. All of these banks offer great Reward Checking and are available to all US residents in any of the 50 states. 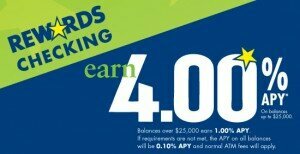 If you live near an East Carolina Bank, they are offering a checking rewards account that is paying 4.01% APY on any balance up to $25,000 and 1.01% APY on balances over $25,000. I believe you have to be a resident of North Carolina, where you will find these banks. If for some reason you do not meet the requirements for this rewards account the interest rate falls to 0.05% APY. The rewards checking account also comes with $20 in refundable ATM fees per statement cycle. Many banks who offer these high reward accounts usually require you to actually use their bank for most of your transactions. This keeps people from just opening accounts, placing funds in the account and leaving it alone while you earn the higher interest rates. This will also help the bank generate funds. The minimum deposit required for this account is $100. The East Carolina Bank has a savings account that is offering 1.5% APY on any balance up to $50,000. The portion of your account balance over $50,000 will be paid 1.01% APY. The savings account has a minimum $200 balance to avoid the $2 monthly service charge. To find a branch near you, visit the East Carolina Bank site. These banks are located in Washington, Leland, Morehead City, New Bern, Currituck, Hatteras, Engelhard, Williamston, Wilmington, Hertford, Greenville and Columbia, North Carolina. First Federal is now offering a 5 year CD rate of 3.5% APY with a minimum deposit of $1,000 and a 3 year CD rate of 2.65% APY with a minimum deposit of $20,000, this rate drops to 2.40% APY for a $1,000 minimum deposit. Both of these CDs come with an early withdrawal penalty of 180 days’ interest. The First Federal CDs are limited to residents of North Carolina, South Carolina, Georgia and Florida. You can apply for one of these CDs online and transfer funds through ACH transfer. You can lock the rate by submitting your application online. The maximum you can deposit into one of these CDs is $50,000 and upon maturity First Federal will mail you a check. First Federal is also offering a high yield interest checking account called Moolah Checking and is currently paying 2.51% APY for any account up to $25,000. You can find branches in North and South Carolina. First Federal is rated 3 of 5 stars from Bankrate and is FDIC insured. You can visit their website here to find more up to date CD Rates. Want to become a Millionaire? Its easy. Becoming a millionaire may not be as difficult as you think. If you can wrap your head around the fact that you are not going to “Get Rich Quick”, well about 99.9% of us won’t, you are on your way to retiring a millionaire. Becoming a millionaire takes time and financial awareness. Investopedia has a great piece which lays out 6 Simple Steps to $1 Million. Stop Senseless spending – If you do not need it, don’t buy it. That money can be saved and used to build wealth. If you build wealth now you can buy whatever you want later. Fund Retirement Plans ASAP – Are you putting away in a retirement account? No, then start now. Improve Tax Awareness – Many very good tax deductions are available to those that seek them. These savings add up to amazing amounts over all the years of your life. Own Your Home – There is no gain in renting a home. And now with house prices bottoming out it is a great time to buy and build equity. Avoid Luxury Wheels – Depreciation, that is all I really need to say. If you avoid a huge car payment now, invest that money instead you’ll be able to pay cash for whatever car you want once your a millionaire. The Bottom Line – Saving is how you reach the 7 figure mark. Start early and start now. If you plan to start investing and saving now you can use our resources to help you along the way. Check out our best CD rates and our Best Interest Checking Accounts. Lake Michigan Federal Credit Union is offering a fairly nice high yield checking account. They are located in Michigan but have opened their doors to customers nationwide, so if you live outside of Michigan you can open this high yield checking account. The account is called “Max Checking Account” and provides an interest rate of 4.0% APY on deposits up to $15,000. 4% APY on balances up to $15,000. A max of $15/month in surcharge ATM withdrawal fee refunds. You can learn more about the high yield checking accounts (sometimes referred to rewards checking accounts), visit our interest checking account page to learn more about these rates.